Rain's Birthday is July 7/07. I made that up because I have no idea when her actual birthday is! I also have no clue what breeds she is! Open to guesses! She was a rescue who came to me at around 2 or 3 years. Rain was very scared of men and people in hats! I don't think she had bad experiences with them, she just hadn't seen a lot of them before I met her. Rain was technically my first dog I would train. We bonded quickly and through clicker training we built up her confidence. 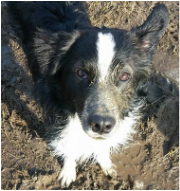 Rain is now competitive in agility, it is her most favourite thing, mine too! She also plays flyball and disc for fun! Favourite place for her is the cottage, this is where she finds the most dead things to roll in! In WoofJocks the weave poles are her favourite event also high jump! Rain knows tons of tricks and LOVES learning! Favourite game is steeling toys from the border collies and playing keep away! Rev -TNC's Rev 'Em Up - definitely lives up to his name. This red rocket is always up for an adventure! 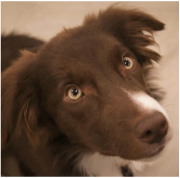 Rev is a young dog training in agility, freestyle dance, rally-obedience, herding, dock diving, dock diving, and just about anything! His favourite past times include hiking, swimming, being a goofball. His most favourite Woofjocks game is barrel racing. This trickster knows over 200 behaviours. He earned his trick dog champion title at only 4 months old! 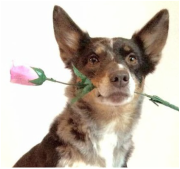 Rev is quite the social butterfly, he is always trying to impress the ladies with his charm. RICOCHET first performed with WoofJocks in the summer of 2014. He is a very social Dalmatian. 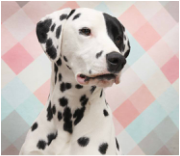 He loves to jump and he is the highest jumping Dalmatian in Canada. How high?? You will have to come to the shows to see! He is a young dog and his talents are just starting to show. He loves to learn, chase his ball, play in the water and is getting pretty good at catching a disc. He is a very active dog who is a great traveller and loves people... especially children. 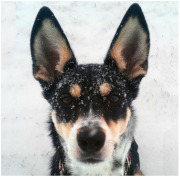 ﻿Rigby is a Kelpie mix adopted from Toronto Animal Services. 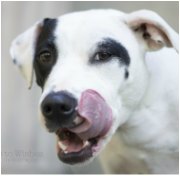 She was found as a stray in September of 2011 and found a forever home with WoofJocks member Emma in November of that year. Rigby's comically over-sized ears sealed the deal for her. She came with her fair share of issues as a result of her difficult start to life, but in less than a year, she was fearlessly performing on the team. 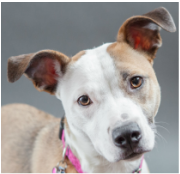 Rigby has proven to be a very attentive and eager learner excelling in obedience, agility, disc work, and just about anything else life throws at her. At home, she is very cuddly and affectionate; equally as happy snuggled up on the couch next to me as she is out running. However by far her favourite activity seems to be annoying Cobain, in typical "little sister" fashion. Since he burst on to the scene seven years ago, Rigby has established himself as both a trailblazing athlete and consummate showman. 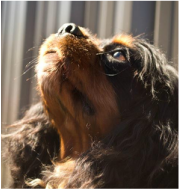 He holds the distinction of being the first Cavalier King Charles Spaniel to officially compete in the sport of dock diving. 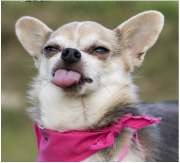 He's also a certified Agility Dog of Canada, has dabbled in rally obedience, and currently acts as MC at WoofJocks performances. 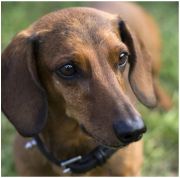 Rosco regularly competes in agility and dock diving. In 2012 he was invited to compete with Team Canada at the World Championship of Dock Dogs. He made it to the finals finishing 4th overall, making his Mamma very proud. Rubix is he youngest addition to our family, he came to live with us when he was 9 weeks old and he is just a delight!!!! He fit in with the rest of the group right away and him and Jenga became fast friends!!! 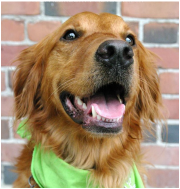 He is currently training in agility and flyball, and enjoys hiking and swimming! He joined the WoofJocks team in 2012 and did some focus and attention work at his first show at 10 weeks of age!! He will no doubt continue his training to preform in many of the events in future shows!! It took Saba a couple of years to get her first time dog owners whipped into shape. She was three years old when she set her sights on the agility ring. In a little over a year she earned her Agility Trial Champion of Canada award. She enjoys Flyball, dock jumping, weight pulling and especially FRISBEE. Last year she started to skateboard and always draws a crowd when she practices at the local park. Being a Frenchie and an athlete has its challenges. In the heat of summer Saba will be found lounging under an umbrella beside or in her very own personal pool (a plastic baby bath tub). Although Saba is new to Woofjocks, she has been performing and entertaining for almost a year now. Her favourite show activities are relay races, musical mats and the pat and chat afterwards. Sgt. Pepper is a Field Golden Retriever -- which means he's, well, just like any other dog, only more so. Much more so. Balls, discs, birds...if it can fly, then Pepper's in hot pursuit. Gravity is no impediment. There are unconfirmed reports that Pepper was once seen taking a nap, but so far we have unable to locate his "Off" switch.. 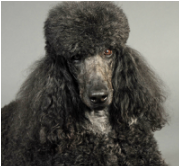 Shade is a Confirmation Champion, Agility Master Champion and Rally Excellent title holder. He also working in obedience. He has earned his Draft Dog title and has started dock diving. All you have to do his look at the expression on his face, and it says it all. Jumping is his passion and it puts a smile on his face. He loves to run and chase his toys. He also likes to sleep on his bed, upside down. Sheba the “Spring Board” aka Springer Spaniel Border Collie cross. Sheba was named after the street we picked her up on. 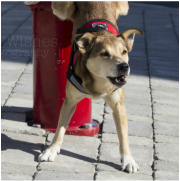 Sheba competes in Disc, Dock, Flyball, Musical Freestyle and Agility. 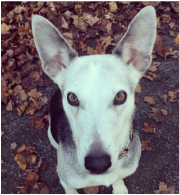 At home Sheba loves to swim in Lake Simcoe and chase the laser pointer. 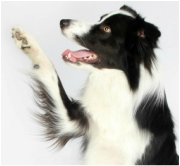 Smash is a sport bred dog who excels at Flyball, recently earning his Onyx title - 20,000 points. If he can't be at a flyball tournament, he is happiest playing ball - chuckit at the park, or toss it in the house, if it involves a ball Smash is there. After all that playing he loves to settle in on the couch with any dog or human that will join him. Spyro came to me at 8 months old, scared of his own shadow. The things he has overcome since he's been with me is amazing! 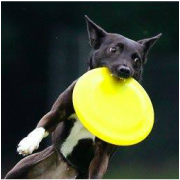 He loves to play frisbee, and play with his doggy friends. He is currently in training for flyball, agility and freestyle and is loving every moment of his training! I cannot wait to take on the world with him. Spyro has two WoofJock siblings - Jassy and Liberty! Stella first performed with the WoofJocks Canine All Stars in the summer of 2014. 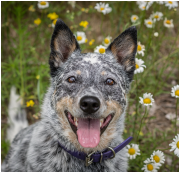 She is an Australian Cattle dog with lots of energy to spare. 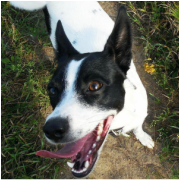 Stella loves playing lots of different sports that includes flyball, disc, agility and her most favourite dock jumping. 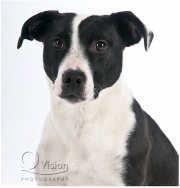 Stella has an interesting coat colour set her apart from most dogs and she loves having the attention of the crowd. She is very alert, witty, brave, honest, and absolutely loyal to her owner. Surf has relocated to the West Coast, so he sadly no longer struts his stuff with the Woofjocks... Although we secretly hope that he will someday return to Ontario and rejoin all of his friends on the team who miss him terribly! Blink and you'll miss him! Surf's Up (aka "Surf" to his friends) has been with WoofJocks for a year now. He gets very excited when packing for a day of demo fun. Surf loves to show the crowd his tricks with Frisbees in freestyle and high speed racing in the games for the show. 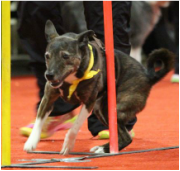 When not with Woofjocks Surf loves to learn new tricks and compete in agility. Best of all, Surf loves playing tug with his older brother Sk8er. At night he dreams of his next demo. Tactix likes to run fast, jump high, cause trouble and steel timbits left on people's crates backstage. In other words he is an amazingly BAD dog! 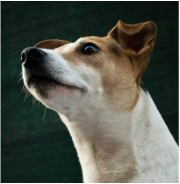 He excels in everything he tries, from agility, to flyball, to dock diving, you name it... Tactix will do it! Watch out for him in the Tug demo and Ball-der-dash game. He sure is naughty, but he makes the audience (and the rest of the team) laugh in the process! 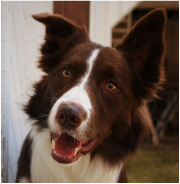 Tobey enjoys doing obedience, agility and herding…but really enjoys playing the WoofJocks games such as musical mats and barrel racing. Although Tobey enjoys most activities, Tobey absolutely LOVES his Frisbee…although he has never quite figured out that he’s supposed to catch it with his mouth and not his paws. When not performing Tobey loves to curl up on a lap for a little R&R. 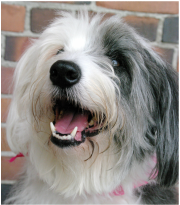 PBGV's are rarely seen breed in Ontario. They are a French Scenting Hound. Most people think he looks like a Basset Hound with long hair... and that's pretty much right! Tumbleweed is 8 years old. He was born in Calgary. He was named Tumbleweed in honour of his western heritage, but also because he 'tumbled' off things when he was a puppy! He loves to run, jump, sniff and howl... Weaving, tunnels, and teeter totters are among his favourite things. 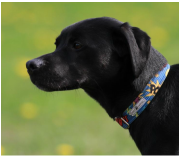 He has achieved his Advanced Agility Dog of Canada, and Games Dog of Canada title and we're hoping for more! He digs the girls, socks, crunching on empty coke bottles, rough-housing with his little sister Dandilion, and cheating at musical mats... sssh...! 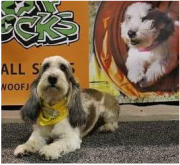 Buddy's half brother, Wii Willy, is happy playing Mats and Barrels in the WoofJock show. 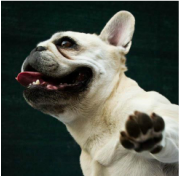 Wii Willy loves to hop and spin for the laughs from the fans! Wii Willy's job is to make you smile, and I think he does a pretty good job of it! Yardley is an English Cocker Spaniel who may look stylish but don’t let him fool you, he loves a good game of fetch in the woods. He made his television debut on the “This is Daniel Cook” show at the tender age of 9 weeks, and by the time he was 12 weeks old he was already involved with performance work. 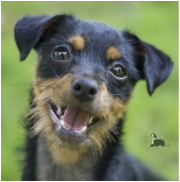 He is skilled in Agility, Flyball and obedience. 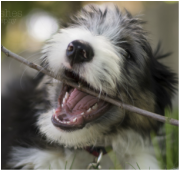 Perhaps he is not quite as speedy as his Border Collie friends, but he can certainly hold his own, and makes up for it all with his enthusiasm. His claim to fame is as a “Pro Carter”. Yes, you will often see Yardley pulling his wagon behind him, wowing the crowds. However, he can also be seen racing through tunnels and over jumps, always with his ears in full view. Blink, and you'll miss her! Zoey is a 9 pound ball of white hair, flying through the air with the greatest of ease. 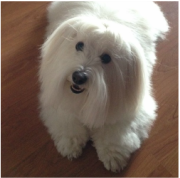 Coton's are generally thought of as lap-dogs (and Zoey does enjoy taking it easy at home), but when you get her out on an agility course, she's ready to go! She's a little bit shy around other dogs, but loves to say hi to all the kids in the crowd after a show. She loves to be where ever the people are, and learning new tricks!